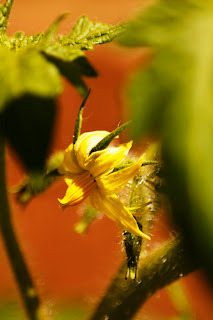 My tomato plants have a combined sixteen blooms, which is up about three fold from a few days ago. That compost most really be working its magic, because I haven't used any other additives. I am worried about a couple of rabbits we've seen in the backyard of late, though. Update: I was mistaken, there are 24 blooms, rather than 16.